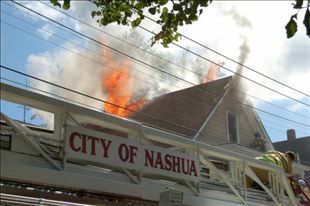 On Saturday September 20, 2008 at approximately 1040 hours, Nashua Fire Alarm received a phone call reporting a possible electrical fire at 94 Pine Street. Engine 2, Engine 6, Ladder 2, and Deputy Allison along with the Safety Officer responded on the initial dispatch. Ladder Co. 2 arrived on the scene and reported a Working Fire in a large 2.5 story wood-frame structure. Engine Co. 4 responded on the working fire assignment. 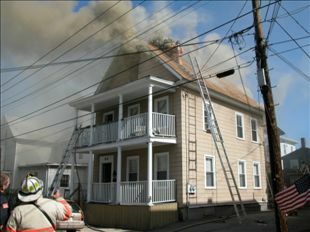 A 2nd alarm was quickly transmitted after companies determined that the fire had extended from to the third floor attic. Engine 1 and Ladder 1 responded on the second alarm and assisted companies in opening up the building. Deputy Allison requested the 3rd alarm which brought Engine 5, Engine 3, and Tower 1 to the fire. While companies worked on opening the ceiling on the third floor, a large area of ceiling collapsed causing one firefighter to be transported to SNHMC for minor injuries. The firefighter was treated and released a short time later. The fire was investigated by the Nashua Fire Marshal's office and the cause was believed to have been electrical in nature. The were no civilian injuries and several pets were rescued from the building. 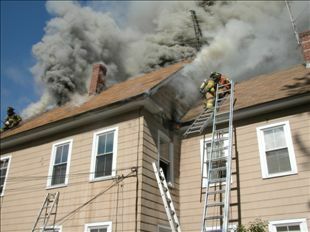 Ladder Co. 2 works to vent the roof as Deputy Allison commands the fire. 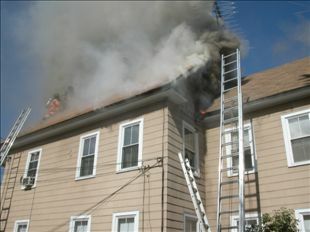 Additional ground ladders were required on side 4. Engine Co. 1 opening up the exterior walls on side 4. Utility lines created access problems for aerial ladders. 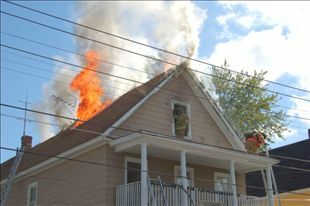 Fire venting the roof as firefighters enter the attic area. 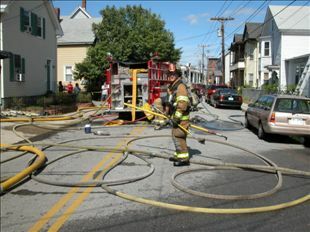 A Probationary Firefighter attempts to follow his hose line back to the rig. All photos provided to www.IAFF789.org.